A candlelight vigil was also held to remember those that have died from drugs. The Taoiseach poses for photos with locals from the north inner city. DESPITE SOME CALLS for the Taoiseach not show up to turn on the Christmas lights in the north inner city of Dublin this year, the event went off without a hitch this evening. Enda Kenny arrived to a singing crowd at the junction of Buckingham Street and Sean McDermott Street. Upon request of the Inner City Organisation Network (ICON), a Christmas tree has been erected by Dublin City Council. The group said it sends a message of “defiance, hope and in commemoration of all those who died from drug addiction”. 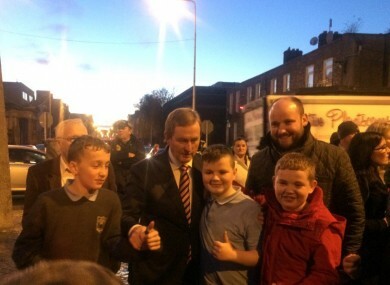 As Christmas songs like ‘White Christmas’ played in the background, the Taoiseach posed for photos with the local kids. Others in attendance included the former Lord Mayor of Dublin Christy Burke, local councillor Social Democrat’s Gary Gannon, as well as the Minister for Public Expenditure and Reform Paschal Donohoe. Local activists spoke about the recent trauma gangland violence had inflicted on the local community and a candlelight vigil was held as the names of some of those who have lost their lives to drugs were read out. Then, following a countdown, the Taoiseach turned on the Christmas tree lights, which was followed by a sing-song. It’s understood Kieran Mulvey’s report on the north inner city will be ready within a matter of weeks. A large number of groups have made submissions to Mulvey. It will detail the criminal and infrastructural issues faced by residents of the north inner-city. The report will go to Cabinet to be discussed before the resource allocation and the cost of improvements are approved by government. Email “Enda Kenny turns on the Christmas lights in Dublin's north inner city ”. Feedback on “Enda Kenny turns on the Christmas lights in Dublin's north inner city ”.